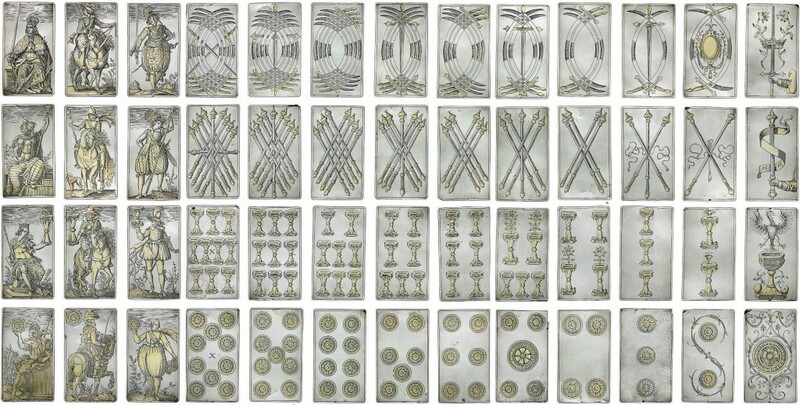 There are only 4 similar sets of Renaissance silver playing card known in the world, and this is the only complete one. The engraved and gilt silver cards were made in Augsburg, Germany, by Michael Frömmer in 1616. They’re the Italian deck – ace through 10, plus knaves, knights and kings in suits of coins, cups, sticks and swords. They weren’t made for actual playing, though, but rather for a wealthy owner to display in an elaborate curio cabinet much like this one, which was also made in 17th century Augsburg. The set will go on sale at Christie’s Important Silver sale on October 19. The estimated sale price is $150,000-250,000 (a sum I can’t help but point out is far smaller than the what the Turner and Delahaye Roadster ending up going for). Given the exquisite provenance, Michael Frömmer’s renown as maker of silver card sets including a French-suited deck that is part of the Pomeranian Kunstschrank, the most famous curiosity cabinet of the era, and it’s complete beauty, I would expect that estimate to be well exceeded. I would love to play a rousing game of Scopa with that set, curio cabinet be damned. This entry was posted on Sunday, October 10th, 2010 at 9:05 PM	and is filed under Renaissance, Treasures. You can follow any responses to this entry through the RSS 2.0 feed. You can skip to the end and leave a response. Pinging is currently not allowed. I have collected silver art since I had my own independent income, starting with late 17th century English and Huguenot pieces. Then as the market became far far too pricy for my taste, I bought 18th century silver and finally I changed over to collecting porcelain. But always Augsburg and Nuremburg pieces from the early 17th century remained the benchmark for top quality design and craftsmanship. I’ve never seen silver playing cards before, but I will certainly recognise them if they come up again *sigh deeply*. The quality of the engraving and gilding is exceptional. I imagine even when the market in 17th century silver was relatively affordable, this set would have blown through the curve. You must have a beautiful collection. You were able to keep it together even after you stopped adding to it, I hope? How would you shuffle them? I have thought about this long and hard. I have decided that first some kind of clear, thin but insanely strong protective membrane would be constructed to encase each card. Then I would do that shuffle where you throw bits from half the deck in front of the rest of the deck you’re holding in your other hand. You know the one I mean? Yes, but that doesn’t work so well. It mostly just looks cool while you’re doing it. Plus the membrane would have to be pretty slick. That’s always the problem with card protectors, they inhibit the free movement required for a proper shuffle. Oh yes, the membrane would have to be like an epidermal layer. With like, dead bits flaking off? Cool. I wonder if all of the family members are in agreement about auctioning off the 17th Century Silver Playing Cards?